My last Tips for Better Blogging post discussed why it’s important to have a good blog design. 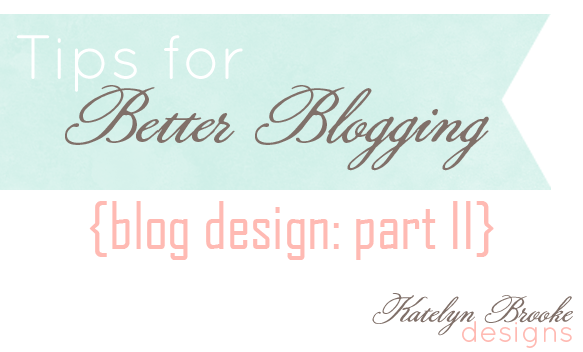 This second part is going to discuss the pros and cons of designing your blog yourself. There are plenty of good reasons to take your blog design into your own hands. Maybe you are just starting out, and aren’t sure you want to stick with this blogging thing just yet. Maybe you have no idea what you want your blog to look like, and prefer to experiment yourself, and be able to change it as often as you like. Or maybe you have a background in coding or design and feel that the leap to blog design wouldn’t be too far, or maybe even a beneficial skill for you to have. All of those are legitimately great reasons to design your blog yourself. For my first two years of blogging, I fell squarely into that first category. I had no indication whatsoever that this blogging thing was going to work out. I still felt a little silly for even doing it at all. Spend money on my blog? On my college student budget? Nope, sorry. I didn’t even know what my blog was about, how would I ever tell someone how to design for it? It wasn’t until I had graduated college and found myself with some time on my hands that I started really wanting to grow my blog. And I started to notice just how outdated my blog design looked. I stumbled upon a blog design class, thought it over, and decided that this would be a great skill for me to have. And I might even get a new blog design out of it! Taking that class was a great decision. It got me here! I learned more than I could have imagined. But if I had only been looking for a way to spiff up my blog, it wouldn’t have been worth the investment. Here’s why: I would have spent way, way, way more time trying to learn how to code, design, and then install that design on my blog. And even then, it probably wouldn’t have looked very good, because designing takes practice. If time equals money, I would have way overspent in the time department when I could have paid someone else to do it for me, for much less time, because they would already have the skill sets necessary to do the design. If I already had a full time job, was fulfilled in my creative outlets, and was lacking in time, learning how to design my blog wouldn’t have been that useful or necessary. Please don’t take this post as a plug for you to come hire me. It’s not. (But if you’re interested I’d love to work with you!) This is simply me sharing my experience with you, and why I think that in certain circumstances, hiring a blog designer might actually be a better value than doing it yourself. There are TONS of great and affordable blog designers out there, so if you’re in the market, go find a blog designer who’s style you love. Not just someone who you feel is competent enough to do what you want, but someone whose expertise will add things to your blog in ways that you aren’t even aware of right now. That person is out there! as I was saying… I am so glad that I did. Your Tips For Better Blogging posts are so helpful, we are rookies and have much to learn. Off to explore more of this lovely place…..